This has been a strange baseball season. Perfect games, Platinum Sombreros, Bengie Molina hit for the cycle. It's madness I tells ya. Cats and dogs living together. This weekend would prove to be no different as we had inside the park home runs on Saturday and Sunday. One believable, one crazy. Gwynn already had one inside the park home run going into Saturday's game against the Diamondbacks so it wasn't a huge surprise when he pulled off his second. Gwynn ripped a liner past Rusty Ryal in the 6th inning and beat Kelly Johnson's relay throw home for his in-the-parker. I was amazed. I had no idea Rusty Ryal was getting MLB playing time. The speedy Gwynn has 13 stolen bases this season and could have more if not for a .323 OBP. In case you live in a cave, Tony Gwynn Jr is obviously the nephew of Chris Gwynn. Jhonny Peralta's inside the park home run today took the perfect storm of ball placement and a player falling through the outfield wall. 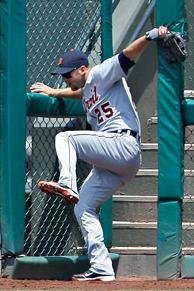 Peralta hit one deep and Tiger's center fielder Ryan Radburn crashed through the Indian's bullpen door. The ball bounced back into the outfield and there wasn't another outfield arm capable of throwing out the fleet of foot Peralta. With Bengie Molina hitting a triple and Peralta hitting an inside the parker, I fully expect Jason Kendall to hit the league's first 3-run, infield single tomorrow. By the way, Kendall gets tagged out on that single while forgetting where to go following a hit and running into center field. Labels: inside the park home run, tony gwynn jr, why doesn't jhonny peralta know where to put the h in his name?